People often wonder whether they can claim certain dependents, whether they qualify for head of household filing status, or if they can claim the earned income tax credit. These three tax benefits are very closely related, and they're all designed to help minimize the tax burden for working families. But each has its own unique, separate requirements, and this is where things can get complicated. We'll start with dependents because the other two tax incentives—head of household filing status and the earned income credit—both require that a taxpayer have one or more dependents to become eligible. Dependents are often children because, by definition, a dependent is someone who relies upon someone else for financial support. But this doesn't mean that your dependents can only be your sons or daughters. Other types of dependent relationships can exist as well, such as with parents, grandparents, nieces, nephews, and other family members. Different rules can apply to them, however. There are two ways to qualify as a dependent, either under the qualifying child criteria or under the qualifying relative rules. A qualifying child must be younger than age 19 on the last day of the tax year or age 24 if he's a full-time student. There are no age restrictions if he's totally and permanently disabled. He must have lived in your home for more than half the year. Living away in a dorm room at school is considered a temporary absence from your home so he would still qualify as living with you if your house is his home base. He cannot have provided more than half his own financial support during the year. 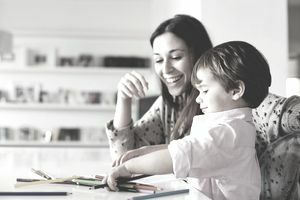 In some cases, a custodial parent who has the right to claim her child as a dependent can waive that right, effectively giving it to the other parent, while still retaining eligibility for head of household filing status and the earned income credit. The rules for qualifying relatives are similar, but there are no age or disability limitations—with one exception. The dependent cannot be the qualifying child of another taxpayer. Some relatives, including your parents and siblings, are exempt from the rule that they must live in your residence, but those who do have to live with you must reside in your home for the entire year, not just more than six months. The dependent's total income for the year must be less than the amount of that year's personal exemption, and this is where the situation gets tricky. The Tax Cuts and Jobs Act (TCJA) eliminated personal exemptions from the tax code when it went into effect in January 2018. But it retains provisions for the amount of the exemption for purposes of determining dependents for other tax breaks. It was initially announced that the exemption amount for 2018 would be $4,150, but then the TCJA made yet another change. It tweaked inflationary adjustments to certain tax provisions so they're now calculated using the chained consumer price index (CPI), rather than the traditional CPI as has been the case in the past. This is not expected to result in a big change, however. The exemption amount should still be somewhere in the neighborhood of $4,150. It just might not be exactly $4,150. Claiming a dependent—or being eligible to claim a dependent—can still open the door to several tax-saving benefits even though personal exemptions have been eliminated. You can become eligible for the earned income credit, the child tax credit, the child and dependent care tax credit, and education tax credits or deductions for that dependent, to name just a few. Filing as head of household widens the income brackets to which each tax rate applies. For example, a head of household filer can earn up to $51,800 before he moves into the 22 percent tax bracket as of 2018. This threshold is only $38,700 for single filers, and if you take away her dependent, a head of household filer becomes a single filer. A taxpayer must have at least one dependent and be unmarried or "considered" unmarried under IRS rules to be eligible for head of household status, so this tax benefit is particularly well-suited for single parents. You can still qualify if you're separated from your spouse but not legally divorced if you don't live with him after June 30 of the tax year. Unlike the rules for simply claiming a dependent, qualifying as head of household requires that your dependent must be closely related to you by birth or marriage. Your dependent must reside with you for more than half the year, and you must provide more than half the total costs of keeping up your home. The last two requirements are not the case for simply claiming someone as a dependent. For example, your parent doesn't have to actually reside with you for you to be able to claim her as a dependent, but she does have to live with you for at least half the year for you to qualify as head of household—unless you have another dependent who does live with you all year. And the rule regarding the costs of your home is unique to this filing status. The earned income credit is a refundable tax credit for lower-income families. In other words, the IRS will actually send you a refund for any portion of the credit that remains after it applying it to eliminate any tax bill you might owe. Children, grandchildren, brothers, sisters, nieces, and nephews can all qualify as dependents for EITC purposes, but parents, grandparents, and other types of relationships generally will not. Your dependent person must be younger than age 19, or age 24 if he's a full-time student. All these limitations and rules can cause frustration when a taxpayer is caring for and financially supporting another person, but there's no relationship between them by blood or marriage. Such a taxpayer might find that she's eligible only for the single filing status and can't claim the earned income credit. Tax preparation software usually includes questionnaires to help taxpayers determine whether they're eligible to claim a dependent, to file as head of household, or to claim the earned income credit. Many of these interview questions might seem repetitive, but that's because the criteria are slightly different in each case. The IRS also provides a web tool called the EITC Assistant to help taxpayers figure out if they qualify for the earned income credit. The important takeaway here is that just because you can claim a dependent, it doesn't automatically make you eligible for other tax perks. Your best bet would be to invest in quality tax preparation software or consult with a tax professional if you're unsure where you stand.